Crusaders Quest 1.11.9.KG APK is now available with so many improvements from the developer. In the latest version you will get better performance. This is a game that combines action with RPG in visual pixelated. A game which is intended for mobile devices that can now be obtained through the service’s App Store and Google Play Store. This is the latest action RPG game pixel of South Korean developer, TOAST. 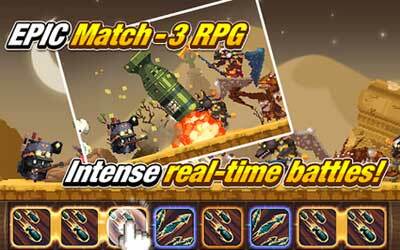 In this game, players get more than 200 heroes and defeat from monsters attack in rescue mission from evil forces. After strengthen your hero troops, bring them into PvP battle to test your strength against the world. With 200 collectible hero, there is no limit to combine your forces can be brought to the battlefield. Now, the game is already available on the iPhone, iPad and Android. Real-time and fast paced puzzle combat! Match your heroes’ skill blocks to quickly decimate your foes. Play 6 unique classes and recruit over 200 unique heroes, each with their own strengths on the pixelated battlefield. Quest to save the kidnapped Goddesses and add their powers to your team. Level up your characters and equip hundreds of powerful weapons to strengthen your 8-bit crusaders! Beautiful 8-bit pixel graphics that capture the retro feel of classic RPGs. Challenge your friends for Honor in the PVP arena and see who has strongest heroes! Challenge the Master of Souls, Lord Soltar, on the new 8th Floor in the Fortress of Souls! You can now purchase one Golden Weapon Box from the Shop. Roland’s Passive and Skill Block effects have been changed. Bug Fixes & Client Optimization. The game is fun and addicting. The heroes you can play with have a balanced setup.